Thank you Second Harvest Food Bank for all of your support, and for being a wonderful community partner! Thank you for also sharing the following: "HomeFirst Services shelter runs a nightly pick up route, rescuing approximately 450 pounds of nutritious Starbucks sandwiches, salads and bistro boxes every night! On January 25th, HomeFirst received a new refrigeration unit as a part of Starbucks’ Capacity Grant to maximize their storage needs. Second Harvest was happy to help HomeFirst apply for this grant opportunity and expand their shelter’s ability to serve as many people as possible. We are fortunate to be working with amazing partners like HomeFirst and Starbucks!" 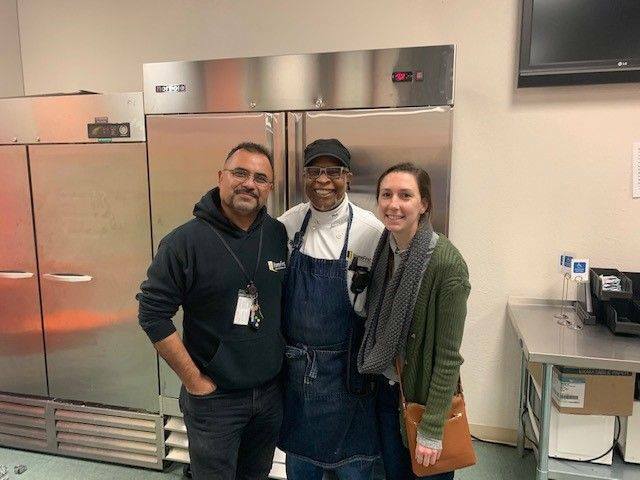 Pictured: HomeFirst’s Orlando Rivas and Chef Paul with Melissa Gaherty of Second Harvest Food Bank.